Individual Lemon Meringue Pie from Caffe Habitu. It does look delicious ! Beautifully done ! Beautiful work. It certainly looks delicious. Mmmmm - it looks delicious! I can understand why you ate half before you painted it! Love the working of your background (and of course your food art remains masterful). 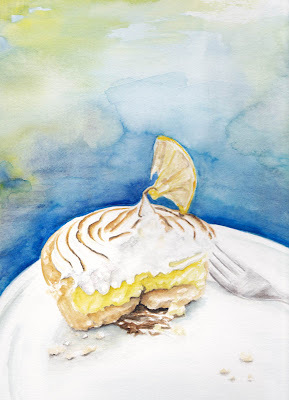 I'd love to have a bite :-)) Your painting looks good enough to eat!! Love your painting style!